As the world's news media, commentators, pundits and bloggers obsess with the US presidential election's impact on Afghanistan and Pakistan and anticipated South Asia policy changes in Washington, it seems that the view from China, Pakistan's most reliable ally, has not gotten much attention. Being a neighbor and an emerging superpower, China is at least as important to Pakistan as the United States, if not more so. Currently, China is the biggest buyer of the US treasury bonds that fund the massive US budget deficits. China holds about $520b of US government bonds amounting to about 20% of the total US foreign debt. Without China's willingness to buy and hold US debt, it will be extremely difficult to bail out the ailing US economy. Not only is China a major arms supplier to Pakistani military, but it also provides substantial economic aid as well. 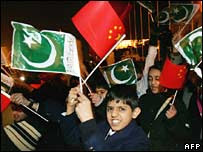 Unlike the United States, China has been consistent in its support of Pakistan for several decades under various governments. It should be noted that former President Musharraf's approval ratings in China remained high in spite of Pakistanis' rejection of him in the recent elections. ISLAMABAD, Pakistan—Pakistan seems to be poised for a showdown with the militants as President Asif Ali Zardari has reiterated his resolve to eliminate terrorists. Pakistan’s security forces have been pounding militants’ hideouts, triggering a backfire from militants. But a new wave of the old threat of terrorism has gripped the country and suggested that Pakistan is far from ready for a showdown with militants. A suicide bomber rammed an explosive car into the headquarters of the Anti-Terrorist Squad of police in Islamabad amid unprecedented security measures taken by the administration for the ongoing joint session of parliament. The two houses of the parliament started a joint in-camera session in a bid to review the current law and order situation and evolve a national consensus on its strategy to fight terrorism on Wednesday. However, local media reports suggested that all opposition groups in the parliament have expressed dissatisfaction with the briefing on security situation and the quality of answers to their questions. The session was suspended and is expected to resume next Monday, with a consensus nowhere in sight. Security has been put on the highest alert in the capital Islamabad recently, which has nearly become a deserted city with little traffic on roads. The security measures are justified by the surge of terrorist attacks. At least 11 bombing attacks have taken place across the country since Zardari was sworn in as president on Sept. 9, leaving more than 100 people dead. Despite condolences and condemnation, Zardari appeared to have ignored the consequences of the attacks. The anti-America sentiment prevails among the people of Pakistan and Zardari is well aware of it. Talking to a U.S. media recently, Zardari said that it was difficult to become a friend of the Untied States. Standing by the United States on the issue of war on terror, the Pakistan People’s Party-led government will have to shoulder responsibility for the worsening security situation, which will inevitably undermine people’s confidence and trust on the party. In addition, it is undeniable that the poor law and order situation in the country has shattered investors’ confidence, exacerbating its economic crisis characterized by widening trade deficit, shrinking foreign reserve and depreciating Pakistani currency. Zardari has rejected compromise with militants and vowed to eradicate terrorism, without giving details about his strategy. Prime Minister Yousaf Raza Gillani has clarified on many occasions that it is the last choice to use force in fighting terrorism. However, Pakistan is left with no other choices as its ally frequently conducts cross-border attacks in its tribal region. Pakistan’s security forces launched a major offensive in Swat valley, a stronghold of pro-Taliban militants last October. The military claimed at the end of 2007 that it had controlled the area that was cleared of militants. Nonetheless, attacks still occur in Swat frequently, a sign that the militants are still there. The Pakistani government has made it clear that it has been combating terrorists on its own interest and the terrorist attacks will not deter its resolve to eradicate terrorism. But the question is: Can it afford the showdown? China is viewing the growing crisis in Pakistan and close US-India ties with great concern. Here's how India based South Asia Analysis group describes it: "A paper produced by the International Institute of Strategic Studies (IISS) of China, a think tank of the People’s Liberation Army (PLA), has brought out many of these questions and warned India of consequences if it decided to do USA’s dirty work. The IISS is an official policy feeder to the Chinese government, and this particular paper (July 6, 2008) has been submitted as “Reference Material” to the government and military policy makers." The IISS paper appears to view the US as dangerously poised in Pakistan using terrorism to threaten China’s security through destroying the territorial integrity of Pakistan and India. It presents several scenarios." Riaz that is a very thorough article on Pakistan's problems. Very unlike anything from the western media that tend to look at some parts of the picture only. [I]"Influential elements in India's government and military are still itching to go to war with Pakistan, even though Pakistan's President Pervez Musharraf has taken considerable political risks by moving against Pakistani-based-and-trained anti-India terrorist groups. Sure, Musharraf made a truculent speech condemning India's ``occupation'' of Kashmir, but that was rhetorical cover for cracking down on those groups. Washington should send New Delhi some history books for these hotheads; there is no human activity more prone to unintended consequences than warfare. As cooler heads in the Indian government well know, history is riddled with examples of parties that initiated hostilities in the belief that conflict would resolutely resolve outstanding issues.